It was my pleasure to award Rev. 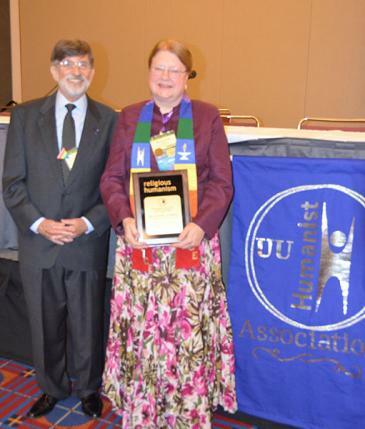 Dr. Kendyl Gibbons the 2015 Religious Humanist of the Year Award at our Annual Meeting at General Assembly on June 25. Here is the introduction I gave to Kendyl, followed by her remarks. Congratulations again, Kendyl! The Reverend Dr. Kendyl Gibbons is the 15th senior minister at All Souls Unitarian Universalist Church. She is a lifelong Unitarian Universalist, a recognized leader in our continental Association, and past president of the Unitarian Universalist Ministers Association. Kendyl is a 1976 graduate of the College of William and Mary, with BAs in Religion and Sociology. She holds a Master’s degree from the University of Chicago Divinity School, and a Doctorate of Ministry from our UU seminary, Meadville/Lombard Theological School. Kendyl served as the minister of the DuPage Unitarian Universalist Church in Naperville, Illinois for fifteen years before being called to the First Unitarian Society of Minneapolis in 1998. In 2012 she was called as the senior minister at All Souls here in Kansas City. Kendyl has a long-standing commitment to theological education and the future of ministry. She has formally supervised more than twenty student ministry internships, and been an informal teacher and mentor to dozens of seminarians. She has been an adjunct faculty member of the United Theological Seminary in the Twin Cities, and former Co-Dean and Mentor for the Humanist Institute. She currently teaches in the areas of worship and liturgy, and the dynamics of professional leadership, and serves as adjunct faculty at her alma mater, Meadville/Lombard Theological School in Chicago. As an active member of the Minneapolis Downtown Interfaith Clergy group, Kendyl traveled to Jerusalem and Bethlehem with twelve Christian, Muslim, and Jewish colleagues in January of 2007. Among her Unitarian Universalist colleagues, she recently chaired the committee that revised the Ministers Association code of conduct and professional guidelines. She lives in Kansas City, east of Troost, with her husband of 40 years, Mark, and two cats. This recognition is a humbling honor, for which I am deeply grateful. in a context of theological pluralism. then it is reasonable to ask, what is it that we are attempting to help each other do? love, joy, peace, gentleness, forbearance, self-control. you will bear this kind of fruit, become this kind of person. if the eight-fold path is working in your life, then you are growing into this kind of person. have long recognized each other across their diverse heritages. a way of being in the world, that manifests these fruits of the spirit. a sense of presence that mediates profound reality unselfconsciously and without argument to others. whose example of maturity other people can rely on for guidance and help. than enforcing their convictions or their authority on others. or popular hysteria -- pulls hard in another direction. as objects of reflection, rather than inevitable facts. whether our own or others’, without panic. and if that is not possible, then there is a desire to flee from the situation. so as to be of genuine help to those who are hurting. at least bear witness to its truth through the eyes of compassion. even if it were possible. so that whatever learning or gift might lie on the other side of suffering may not be wasted. to the ache and effort of genuine healing. and this is nowhere more true than in religious language. or the uniqueness of friendships. and narrate the breaking of a qualitatively different awareness into mundane consciousness. but the open source code of human religious experience. in any system, whether we ourselves prefer PCs or Macs. the poetry of the human spirit wherever it rises to aspiration and praise. are skills we each continue to build as long as we live. certainly the squabbles of theological identity politics will never do so. if only everybody conformed to our opinions. to our commitments, and our values, and our aspirations. and in accountability to the promise of greater maturity that we might yet achieve. and calls forth that more abundant life that we can only bring into being together. Dr. John B. Hooper, president of the Unitarian Universalist Humanist Association (UUHA), is a retired research and development director who lives in Connecticut. John, a long-term UU, is a Board Member of The Humanist Institute, The Institute for Humanist Studies, The Secular Coalition for America Education Fund, The American Humanist Association (ex officio), the Yale Humanist Community, and the Connecticut Coalition of Reason. John is also a cofounder of and advisor to Humanists and Freethinkers of Fairfield County, CT (HFFC).